‘Meghdooth’ luxury bus of NWKRTC suddenly caught fire and was turned into ashes yesterday at 7 pm near hotel Shankam. All the passengers were safely removed without injuries. 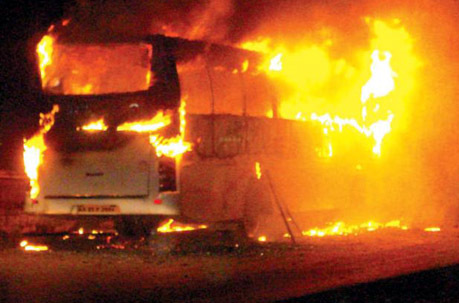 The passengers of the KA 25 F 2594 Hubli bound bus saw smoke inside the bus and immediately told the conductor and driver and both of them immediately rescued all the passengers about 50 of them from the safely. The fire must been caused by a short circuit the fire fighters said.